Does anyone know if the fenders, grill, hood, bumper, etc. of an 04-08 F-150 can be installed on a 03-06 Expedition? I have an 05 expy and im trying put the 04-08 f150 clip or the 07+ expy front clip on, but havent had any sucess on locating helpful info! I have thought about swapping the nose of an 07+ Expedition onto my 06 and it seems do-able. the 03-06 expy fenders and headlights are different enough from the 04-08 f150s that they will probably not just bolt up. I believe the rear of the fender and the frontal door lines are not exactly the same either. You would need the front fenders the hood, grille, lights, bumper cover as well as the bumper reinforcement (trucks have an actual bumper whereas expys have the bar) and valance, the rad core support and all the hardware (pins bolts plastic rivets) and foam backer pad for the upper bumper. Seems easy at first but there are a ton of little parts that are no where near the same. Your best bet would be to find a complete front clip and mold the front of the expy fenders to the rear of the f150 fenders and then align everything and probably make new mounting holes for a majority of the parts. I have taken apart quite a few 03-06 expys and they are very different from the f150s once you look past the "skin"
Oh ok, a lot more work than I thought it would be. 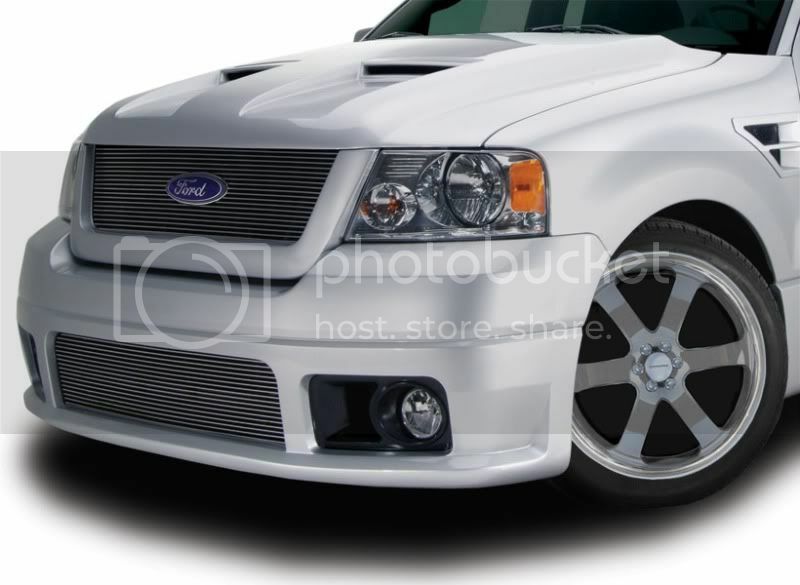 Now is is possible to use just the 07 Expeditions headlights and modify the bumper to fit it and possibly the grill? What exactly would I have to change? Sorry if I hijacked this thread btw. no sorry, the front fender area as well as the upper bumper trim is way different from the 07 expy to the 04-08 f150s. The lights bolt and fit into the core support so that would be needed just to "bolt" the lights in. and i dont think it will be a simple modify/ retrofit fror the lights and grille. Does the grill come up with the hood on the expys? I know the 03-06s the grille stayed down and just the hood came up unlike the truck where the grille goes up with the hood. Dont get me wrong though, it CAN be done, but as to what price is the question. a simple grille and headlight swap could be done but so many little things would need to be modified it may not be reasonable. I have often contemplated doing a 07+ expy front. I think its safe to say that if you have to ask if it will work, more than likely its not something you will want to handle on your own. No disrespect intended by any means, but it may be better to leave it to a pro custom body shop and it will probably be too expensive for such a subtle front upgrade. Search for my Expedition mirrors thread, youll see how much work goes into making something look factory and the price I estimated it would take to replicate it. And that was just for mirrors. lol You know darn well the 03-06 expy is VERY close to your year model trucks! yea the 01 thru 2010 gen expy/navi have a vary similar platform the earlier of which is nearly identical to the late (01ish?) pre 04+ truck.